According to popular Thai tradition, Buddhism was propagated in the region south of present-day Bangkok by the monks Sona and Uttara, who were sent to Suvaṇṇabhūmi (the golden land) by the Mauryan king Aśoka in the 3rd century B.C.E. According to this view, from these beginnings Buddhism of a Theravāda persuasion has dominated the country. Archaeological evidence confirms a flourishing Buddhist culture among the Mon at Dvāravatī in the region of Nakhon Pathom 30 miles southwest of Bangkok as early as the 4th century C.E., but historical evidence fails to corroborate the legend of Aśoka’s emissaries. Furthermore, while both archaeological and textual evidence suggest a strong Pāli Theravāda presence among the Mon states in Thailand and Lower Burma (Myanmar), the Buddhist ubiety in the region was marked by diversity rather than uniformity. through the Mon, the expansion of the Sumatran-based Śrīvijaya kingdom into the southern peninsula, and the growing dominance of the Khmer Empire in the west. These diverse Buddhist expressions, in turn, competed with Brahmanism, Hinduism, and autochthonous animisms. Rather than an organized sectarian lineage, the early religious amalgam in Thailand and other parts of Southeast Asia might be more accurately described as a syncretic collage of miraculous relics and charismatic monks, Hindu dharma śāstra, Brahmin deities, Mahāyāna Buddhas, tantric practices, and Sanskrit Sarvāstivāda and Pāli Theravāda traditions. The eclectic nature of Buddhism in pre-modern Thailand, Laos, and Cambodia is often described as a congruence of Vedic Brahmanism, tantrism, and a pre-Āryan Austro-Asiatic cult of guardian spirits and protective divinities. - the Dharma potency of sounds and letters; and esoteric initiation for the realization of both soteriological and mundane ends. By the 12-13th centuries, Tai migrations from southwest China into Thailand resulted in the establishment of several petty kingdoms, most notably Chiang Mai under King Mangrai (r. 1292-1317) and Sukhothai under King Ram Khamhaeng (r. ca. 1279-1298). Somewhat earlier, the rise to power of the Sinhalese monarch Parakkamabāhu I (r. 1153-1186) in Śrī Lanka and the subsequent dominance of the Mahāvihāra monastic fraternity led to the missionary expansion of Sinhalese Theravāda into Burma and Thailand. A 1287 C.E. inscription at Sukhothai records that Ram Khamhaeng patronized monks of the Lanka order (lankavaṁsa), whom he invited from Nakhon Si Thammarat, a Thai state located far to the south on the Gulf of Siam. Under Tilokaraj (r. 1441-1487) monks of the Mahāvihāra reformist tradition at the Red Forest Monastery (Wat Pā Daeng) in Chiang Mai gained a religious and political prominence that led to a Council under royal sponsorship to regularize monastic teaching and practice. Nevertheless, although Buddhism in the Thai states from Nakhon Si Thammarat in the south to Ayutthaya in central Thailand and Chiang Mai to the north came more under the sway of Sinhala Theravāda, it lacked the uniformity achieved with the formation of the modern nation-state around the turn of the 20th century. Even today, Thai Buddhism is more complex and hybridized than the Pāli canon, the normative commentaries of Buddhaghoṣa (5th century C.E. ), the Mahāvihāra paritta ritual handbook, and a national Saṅgha organization created by the great Supreme Patriarch (saṁgharāt), Wachirayān (Vajirañāṇavarorasa, 1860-1921), would lead one to believe. - Temple festivals begin by invoking the guardian deities of the 4 quarters, zenith, and nadir. - Monastic ordinations are often preceded by an elaborate spirit calling (riak khwan) ceremony. - Yantra tattoos and magical amulets are worn by the devout to ward off danger. - elaborate altars to the Hindu god Brahma occupy a prominent place at the entrance to hotels. - sacrificing a buffalo to the spirits who guard the mountains overlooking the valley. The veneration of King Rāma V (Chulalongkorn, r. 1868-1910), which originated as a cult of his equestrian statue before the parliament building in Bangkok, has spread nationwide. claimed by the founder to be an ancient method rediscovered by the late abbot of Wat Paknam Bhasicharoen, a royal monastery located on Bangkok’s Chao Phraya River. - and kings helped settle Saṅgha disputes. 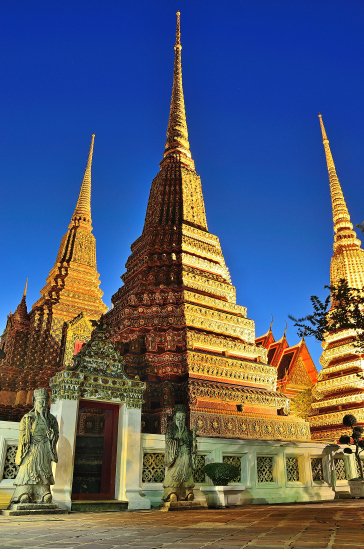 - link the spread of Buddhism and the legitimation of royal power with the veneration of magical Buddha Images and relics, in particular the palladial Emerald Buddha now enshrined on the grounds of the grand palace in Bangkok. In the Trai Phūm Phra Ruang (3 Worlds According to King Ruang), King Lithai of Sukhothai (1346/47-1368/74?) constructed a cosmological legitimation of Buddhist Kingship and the state that in the Ayutthaya period (1569-1767) became a “galactic polity” through which the Ayutthaya monarchs dominated tributary states. It was certainly not a coincidence that when King Rāma I (r. 1782-1809) took over the reins of power at the new Thai capital in Thonburi/Bangkok after the Burmese sacked Ayutthaya in 1767, he sponsored a Saṅgha council that included among its activities the production of a new edition of Lithai’s 3 Worlds According to King Ruang. Ordained a monk for 27 years before he became king (Rāma IV), he founded a new monastic order, the Thammayut or Dhammayuttika Nikāya (“adhering strictly to the dhamma”), in 1829. In 1836 Mongkut was appointed abbot of Wat Bowonniwet Vihāra monastery in Bangkok, which was to become the headquarters of the Thammayut order and the home of its monastic university, Mahāmakut, founded in 1893. Mahāchulalongkorn was established as the University for the larger Mahanikai (great congregation) order at its Bangkok headquarters, Wat Mahathat Yuwaratrangsarit. Both institutions figured prominently in the development of advanced monastic education during the 20th century. Buddhism as a civil religion was promoted by King Vajiravudh (Rama VI, r. 1910-1925) through the promulgation of the slogan, “nation, religion [Buddhism], king,” symbolized by the country’s tricolour national flag. to enlist Saṅgha participation in the government’s efforts to promote rural development, integrate the northern hill tribes into the Thai nation state, and encourage national loyalty in the face of perceived communist threats in sensitive border areas. Khrūbā Sīwichai had ordained monks and novices without been officially recognized as a "preceptor of the Thai hierarchy" leading to his confinement in a temple in Lamphun in about 1915-1916. Sīwichai's perceived ignorance and disregard for the law led to his years of imprisonment. Although they remained Thammayut monks, the movement offered monks an avenue to pursue a spiritual practice freed from many of the constraints imposed by the National Saṅgha. Phra Bodhirak, who founded the Santi Asoke (Peaceful Aśoka) movement in the 1975, was defrocked because he ordained monks in defiance of government regulations. Despite such tensions, state Buddhism has been an overriding feature of Thai history since the founding of Sukhothai and Chiang Mai. The prosperity of the Saṅgha, the national system of monastic study and lay Buddhist education through both monastery and government schools, and the important place Buddhism holds in Thai culture and society has come about through the encouragement and patronage of the state. places a Saṅgha-raja (Saṅgha king) and an appointed council at the head of a hierarchical structure organized into regions, provinces, districts, and sub-districts. e) Buddhist rituals and ceremonies. The formal study of Pāli in Thailand began in the Ayutthaya period, although the system of 9 grades or levels dates from the reign of Rāma II (1809-1824). - the commentary on the Maṅgala-sutta (Maṅgalatthadīpanī) written in 1525 C.E. by Sirimaṅgala, northern Thailand’s greatest Pāli scholar. Although the place of Buddhism as the linchpin of Thai identity has eroded due to the onslaught of globalization and rapid social change, the great majority of Thais still find Buddhism to be a locus of personal meaning and community identity. - and attitudes toward social hierarchy and gender. These principles and values continue to be enacted in social relationships, including the ways in which children relate to parents, younger people to older people, and men to women. The rituals that define a life passage from birth to death and the festivals that mark a similar passage of the year, in the past tied more obviously to seasonal change and an agriculture calendar, have not disappeared even though they are attenuated in urban settings. Scores of young men still ordain annually as novice monks for a brief period, perhaps during a summer vacation rather than the traditional 3-month rains-retreat from mid-July to mid-October. Temporary ordination has been the norm in Thailand for centuries, a very small percentage deciding to remain in the monkhood for a lifetime. According to traditional lore, spending a few months as a monk “ripens” a young man and prepares him for responsible family and community life after he disrobes. Furthermore, Ordination not only functions as a male rite of passage into adulthood, it accrues special merit for one’s parents, especially one’s mother. Girls participate only as onlookers, unlike Burmese custom where both boys and girls are included in shinbyu ceremonies that end in temporary ordination for males and ear-boring for females. Since there is no Women’s Saṅgha, females are denied the male opportunity to make merit for their parents; they can, however, help prevent their parents from falling into penury by supporting them from money earned as prostitutes. - Life transitions of all kinds may be marked by spirit-calling rites, and illness or other personal and community crises are occasions for life-extension rituals. and funerals at monasteries and in homes are such important ritual occasions that a unique chant style was developed for these occasions. Annual festivals continue to serve as events where both men and women, young and old, experience a sense of belonging to a local community and a nation. For some, such as the Thai New Year celebrated at the end of April before the May monsoon rains, commercialism nearly overwhelms traditional practices. However, the old customs of paying respect to elders, building sand “mountains” on the monastery grounds, and lustrating Buddha images and relics remain. but the Festival of the Floating Boats (loi kratong) held during the same month survives in altered form, with the traditional banana-leaf rafts floated on ponds, lakes, and rivers replaced by Styrofoam boats. - endure not only as opportunities to make merit for the benefit of one’s self and extended family both living and dead, but as an affirmation of one’s identity as a Thai Buddhist. The Thailand of today differs vastly from the Tai kingdoms of the 14th century and also from the State Buddhism promoted by King Chulalongkorn and Supreme Patriarch Wachirayān in the early 20th. Buddhism in Thailand today is marked by a cacophony of voices, a pluralism that includes a continuation of traditional forms and practices, a new sectarianism, an efflorescence of magical cults, a multifaceted reform movement, and an internationalism attuned to the emergent global community. Today, Thai Buddhist identity extends beyond the borders of a local community and the nation-state to an increasingly globalized world. State Buddhism established at the beginning of the 20th century and revised by the 1962 Saṅgha law is still intact; however, calls for reforming the conservative, hierarchical Saṅgha governance structure come from younger liberal monks as well as educated laity. There is increasing concern that mainstream civil Buddhism is out of tune with the times that in the affluent decades of the 1980s and 1990s became more complacent and materialistic. To be sure, in villages and towns throughout the country the monastery continues to serve important community functions, especially educating the rural poor, even though many of the roles once filled by monks are now the purview of civil servants. As a result there has been a general decline in the high regard and social status traditionally accorded monks. Several high-profile instances of immorality and rancorous division have also challenged the Saṅgha’s moral authority. The movement continued to grow rapidly in the 1980s, and it gained special prominence through one of its members, General Chamlong Srimuang, a former governor of Bangkok, member of parliament, and founder of the Phalang Dhamma political party. Santi Asoke defined itself against the Thai mainstream, establishing centres where monks and laity observed a moderately ascetic regime, living in simple wooden huts, eating one vegetarian meal daily, and avoiding intoxicants, stimulants, and tobacco. In the view of mainstream Thai Buddhists, Santi Asoke had overstepped acceptable limits both in terms of its independence and its outspoken criticisms of Thai society. on the grounds that he had ordained monks and nuns without authorization and had contravened a Vinaya prohibition forbidding claims to supernatural powers. Its founders, Luang Por Dhammajayo (b. 1944) and Luang Por Dattajivo (b. 1940), were educated in marketing before becoming monks under the inspiration of the Venerable Luang Pu Sodh Candasaro (1884 - 1959) of Wat Paknam, who was noted for his unique visualization meditation method. The entrepreneurial skills they brought to the movement led to its considerable success but has also generated attacks on its commercialism and charges of financial irregularity. its contemporary efflorescence is due in part to their commodification in the face of the cultural dominance of commercial values. The cult of images and relics, furthermore, is matched by the veneration of charismatic monks to whom are ascribed a wide range of apotropaic powers, including the generation of wealth. New cults, abetted by the financial crisis of 1997, include the veneration of images and other material representations of royalty, especially King Rama V, and the popularity of the Bodhisattva Guan Yin (Avalokiteśvara), which testifies to an increasing Chinese influence in the Thai economy. This includes monks who have dedicated their lives to addressing a wide range of social, economic, and environmental problems faced by the people they serve in villages and towns throughout the country. One of the chief inspirations for Buddhist reformism has been Buddhadasa Bhikkhu (1906 - 1993), whose innovative teaching and example continued to inspire the leading Buddhist reformist voices in the country, even after his death in 1993. Although regarded primarily as an outstanding Pāli scholar, Prayudh Payutto (b. 1938), along with Buddhadasa Bhikkhu, have influenced numerous Buddhist social activists including Sulak Sivaraksa (b. 1932), a major figure in the international engaged Buddhist movement. Progressive Thai Buddhists believe that the international problems of global poverty, economic exploitation, and violence require the practice of sustained awareness that lies at the heart of true compassion. Although awareness is an ancient Buddhist practice, its application to a Buddhist social ethic is an innovation that, while running the risk of diminishing its original intent, holds out the promise that the tradition will maintain its relevance to the dramatic dislocations of the postmodern world.